Version 7.3.4 is now available. Go to the Software page for additional details. Outside of China, Japan and India, contact Process Optimization Corp for information on obtaining the FRANC3D software. Specializing in fracture simulation and software development. Fracture Analysis Consultants, Inc. (FAC) was founded in 1988 as a spin-off from high-technology R&D at Cornell University. Our mission is to provide state-of-the-art services in computational fracture mechanics to industry. 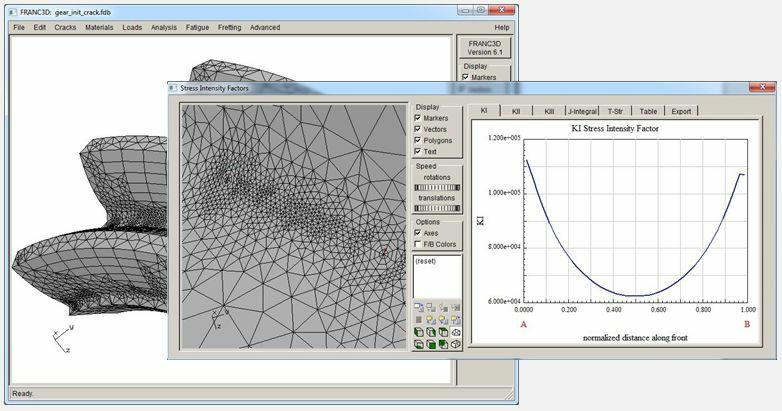 The technological basis for this mission is analysis and simulation programs that integrate linear and non-linear fracture mechanics with finite element methods, advanced geometry and mesh model representations, automatic mesh generation and modification, and effective computer visualization. FAC recognizes the need for agility in responding to today's rapidly changing corporate engineering environments. We provide client-specific component analysis, failure analysis, collaborative analysis, software installation and support, customized software, and training workshops. FAC in partnership with Process Optimization distributes FRANC3D software.